thing to shoot down a child who is looting a pair of shoes or even a television set. Property can be restored, but not life. Society looks at policeman and blames them for the unrest. This is unfair. and, obviously, better training and equipment will be needed. to be born in an automobile and a crowd is gathering in a ghetto. just as he was supposed to deal with the rioters." 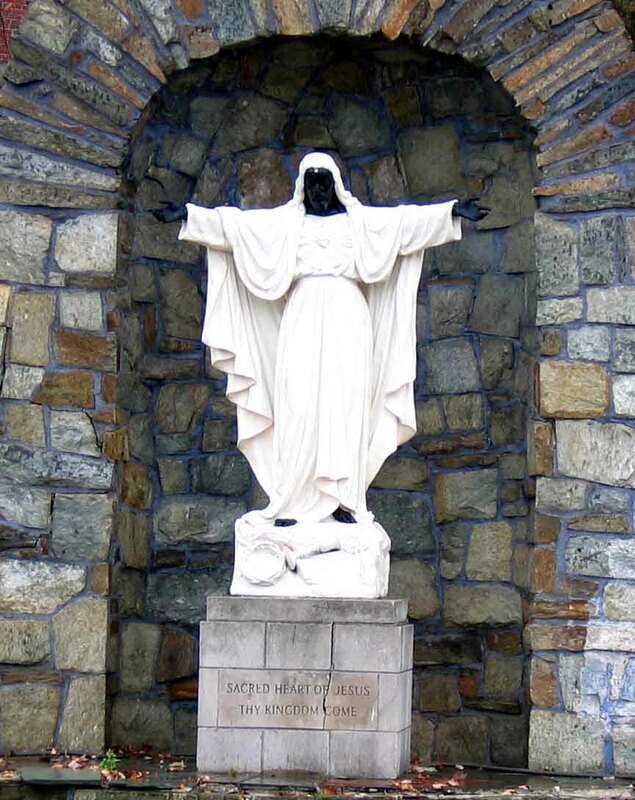 The statue of Jesus, which adorns the front lawn of the Sacred Heart Seminary off Linwood, was painted black during the riot. It has remained that way ever since. Boys will be boys - Post riot normalcy begins a slow return as two Guardsmen take in the Detroit scenery. Detroit, as the birthplace of the automobile, was seen as the symbol of the American dream. Immigrants came to Detroit, procured a good job, bought their first house and retired in peace. Post riot Detroit, in turn, became the poster child for social and economic decay, an urban museum inventorying all that has gone wrong with rust-belt cities after they peaked in the 1950s. encompass some forty-seven buildings providing over 2.5 million square feet. doom for the neighborhood. 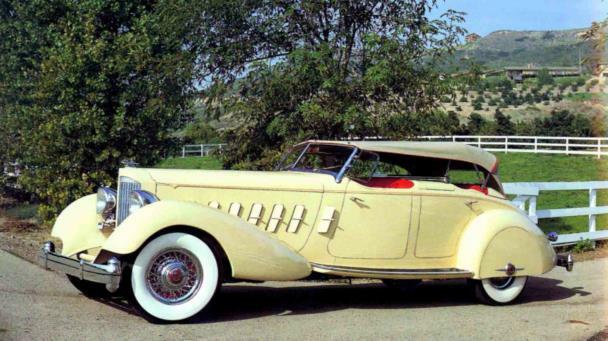 Examples like Packard could be found throughout Detroit. The year 1950 was the high-water mark of prosperity for Detroit. 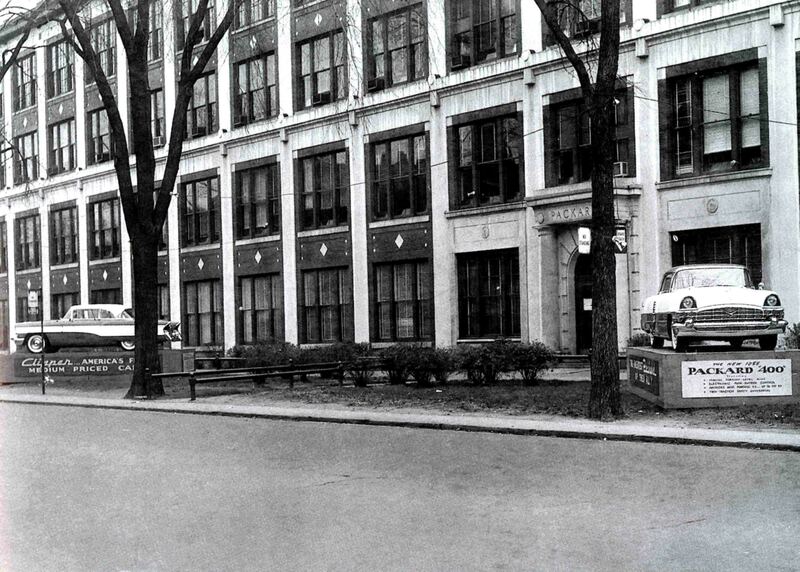 In those days, Detroit was building one out of every two cars in the world. Now it builds one in every thousand. Detroit’s population spiked at 1.8 million and was king of the automotive world. As such, the city brought in millions of dollars each year to its economy as elite hotels like the Statler and Book-Cadillac were filled with out of town automotive conventioneers. Now Detroit’s Depression-era high-rise hotels are either dust or derelicts. Conventions, which were always more monkey business than company business anyway, have found more appreciable climates. Las Vegas, which was a mere speck of dust when Detroit was king, now owns the convention world. Northern cities like Chicago, Detroit and Cleveland will never be able to distance themselves from the fact that for six months of the year the weather is cold, frozen and dreary. industry and of a time when Detroit had something very special to be proud of. It’s time to leave Detroit. Hit Eight Mile Road. uniforms with silver badges – Hit the road. Detroit's fiery mayor Coleman Young. He became the Great Black Hope. 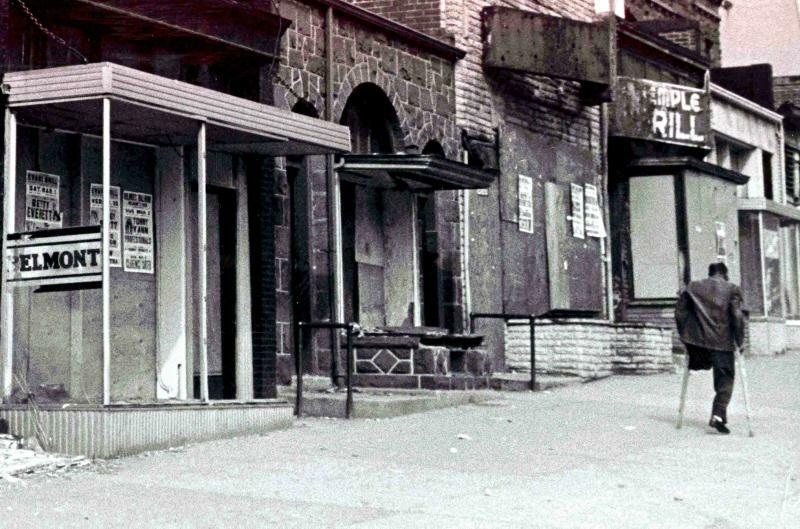 The upheaval of the 1960s help set the stage for an even worse period in the city’s history. 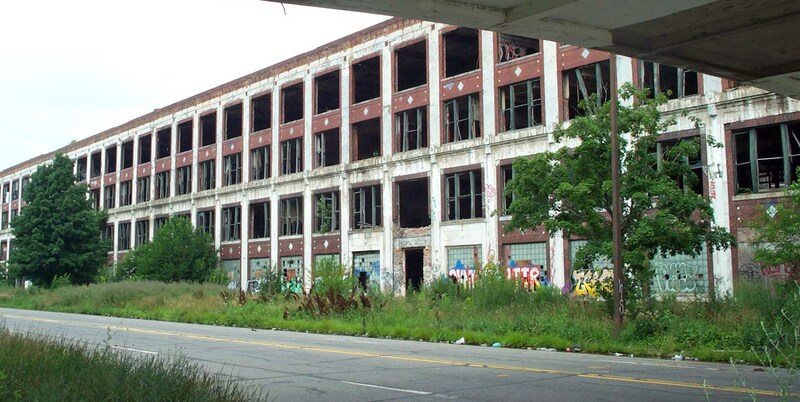 With businesses and citizens frantically leaving Detroit at a record rate, city coffers quickly emptied, leaving a barren desert of resources without even a mirage of hope. The result was predictable, a desperate city with desperate people. 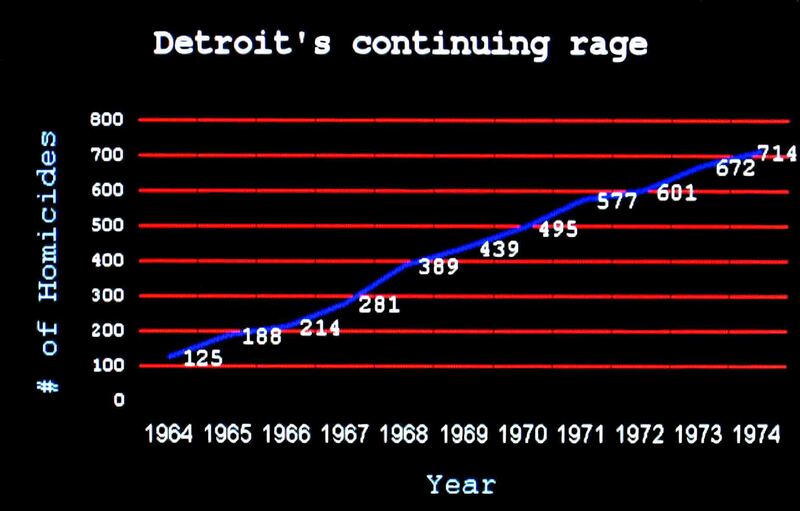 Detroit began a total emotional meltdown with a runaway murder rate which gave it a national black eye and the lingering moniker of the “Murder City.” Police commissioner John Nichols was forced to deal with the avalanche of anger, "The vast majority of these killings are not preventable by pure police methods. They occur in the home. If I knew why them happened, we could try to stop them. 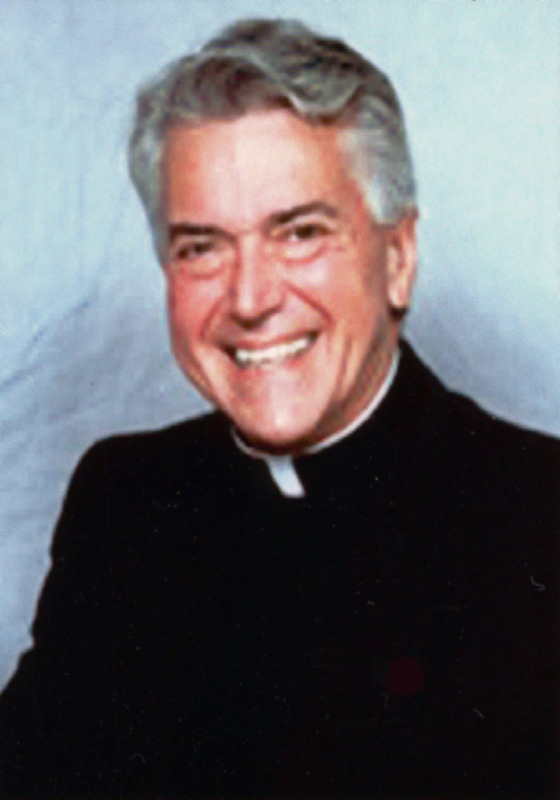 But some of the motivations in these killings stager the imagination." The rage was there. The frustration was there. I think we see it. The more widespread use of narcotics today is an escape. Even the violence, including the shooting, is another release I think of this anger, this ongoing rage and frustration. For the moment, the black community has turned inward on itself. 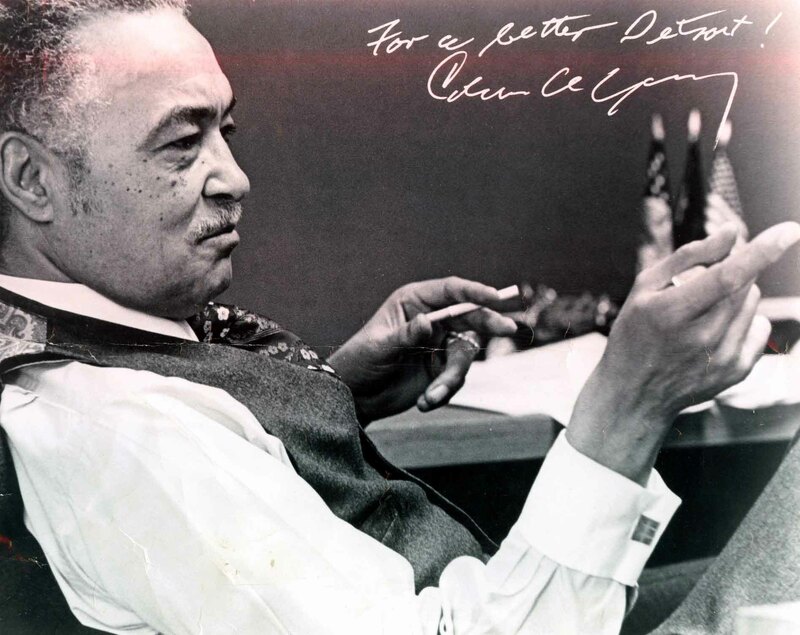 Coleman Young would loom large over Detroit for a variety of reasons. It must be recalled that in the 1960s there were two and only two powerful black leaders. Martin Luther King on the right and Malcolm X on the left. 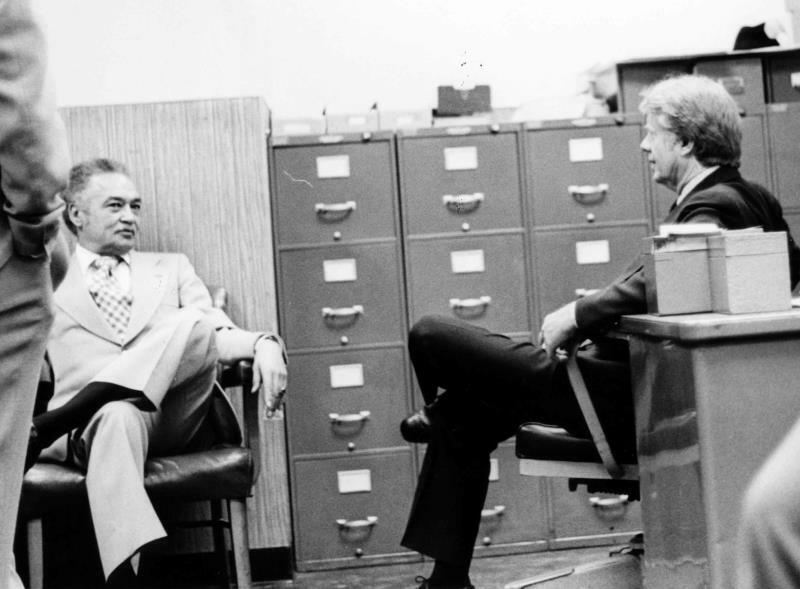 Neither of these towering figures would survive to see the 1970s, leaving a cavernous vacuum in the black community. Then along came Coleman Young, a well-known street fighter who was afraid of no one. While it may have served as a poke in the eye to the white community, Young was a Moses to the leadership starved black community. 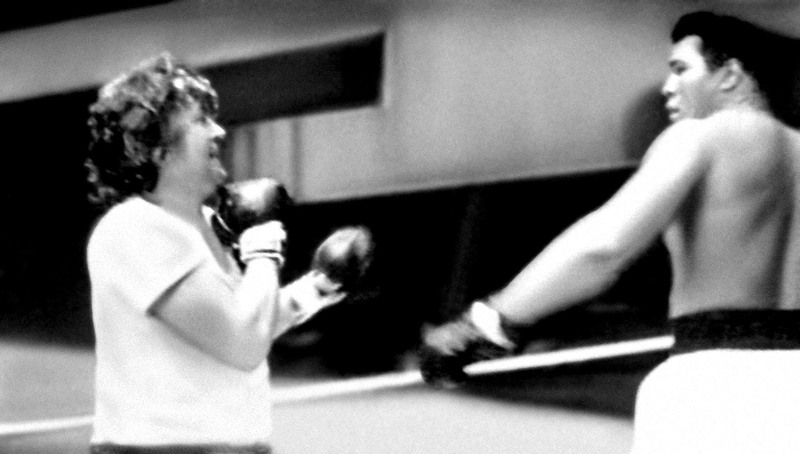 Young’s lifelong attitude was forged by poverty, perspiration and above all, the everlasting sting of prejudice. Among the innumerable humiliating indignities in Young’s life was the Boblo boat incident. In 1931, the then 13 year old Young went on a field trip with his Boy Scout troop, of which he was the only black. Stopped at the dock before boarding, Young was told by a Boblo employee that he could not go because they didn’t allow blacks. 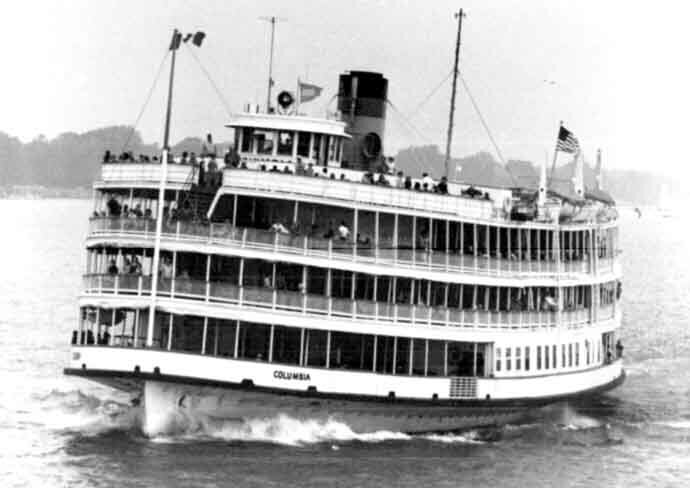 It was a turning point for Young who would remember for the rest of his life the Boblo steamer pulling away from the dock with his friends on it. Henceforth he would view Whites with suspicion and distrust. 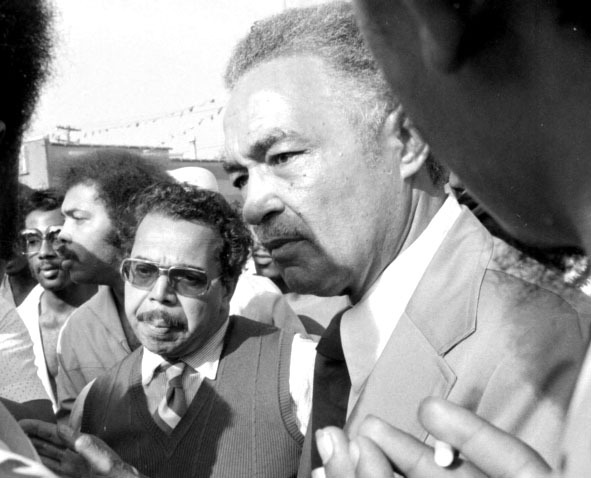 A lifetime of being kicked hard made Coleman Young suspicious of White intentions. The humiliation incurred during the Boblo boat incident of 1931 was an affront that would sting for the rest of his life. 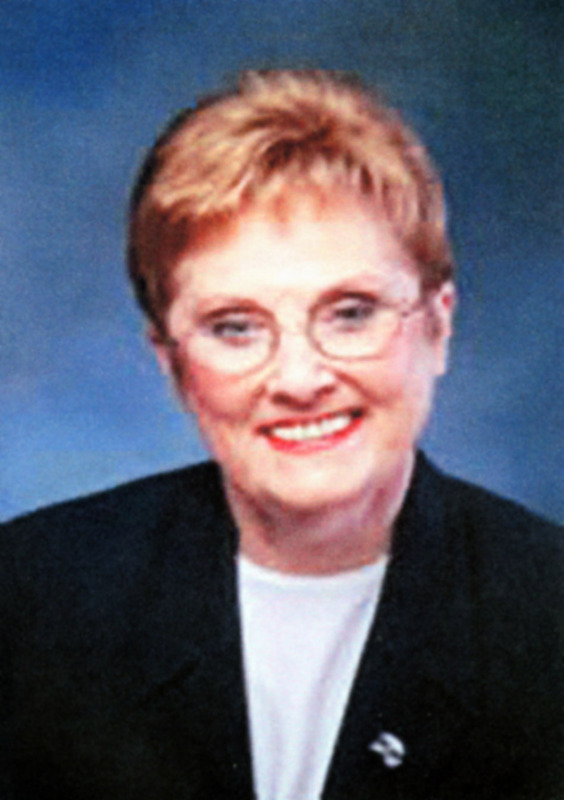 Young’s sharp tongue and left-leaning politics often are blamed for scaring away business and poisoning race relations. Yet research shows that the city’s economy had been in a tailspin for 20 years before Young took over in 1974 and during his tenure he was the most fiscally responsible of any mayor in the last 50 years. Some 400,000 people had high tailed it to the suburbs before the name Coleman Young was even a household name much less a symbol of the city’s decline. 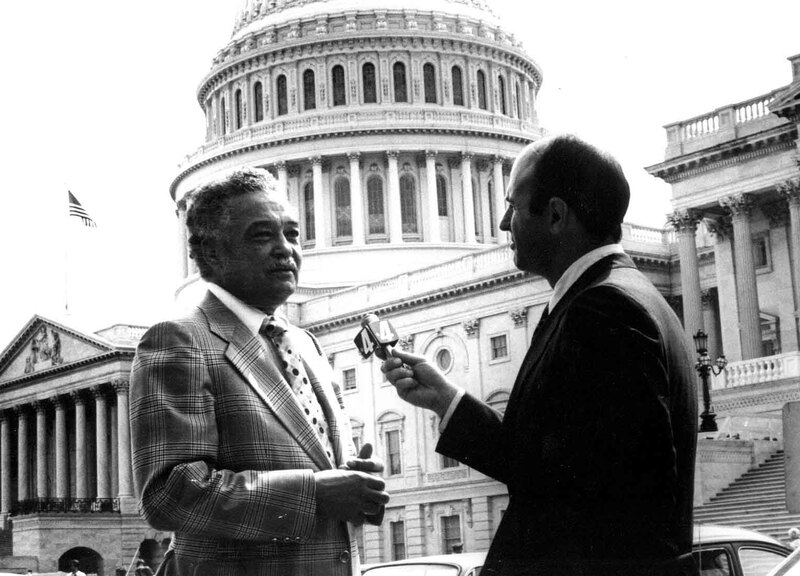 Coleman Young, seen here as a state senator on a visit to Washington, took his hard earned street smarts learned as a child in Detroit’s Black Bottom and became one of the most formidable political wheeler-dealers that state has ever produced. It was once said that a conversation with Young was both a history lesson and an exercise in critical thinking. 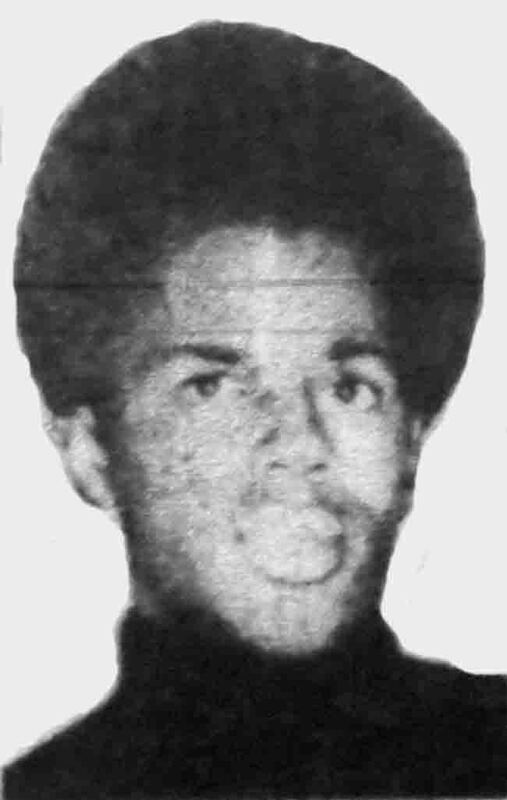 Young ran for mayor of Detroit in 1973 against former Detroit police commissioner John Nichols. Young represented a powerful minority voice and Nichols represented a symbol of the old days of white plutocracy. The winner would have the dubious distinction of taking over the most polarized city in the country, an heir to disaster. A city plague by overwhelming problems and little in the way of resources to solve them. It must be said that all big cities in America were going through dramatic change during the early 1970s. Newark received its first black mayor, Kenneth Gibson, in 1970. Ebullient blacks did cartwheels in the streets, blissfully unaware that Newark, like Detroit, had an unending list of problems to solve and little if any resources to do the job. Old comrades referred to Young as “Big Time” growing up because he always had big ideas and wanted to change the world. His critics had other names. The ghosts from Young's past seemed to always haunt him. He trusted few white people and when those few, Henry Ford II, Jimmy Carter, faded from the scene and were replaced by a less cooperative generation, Young was slowly painted into a corner he could not get out of and the city suffered as a result. 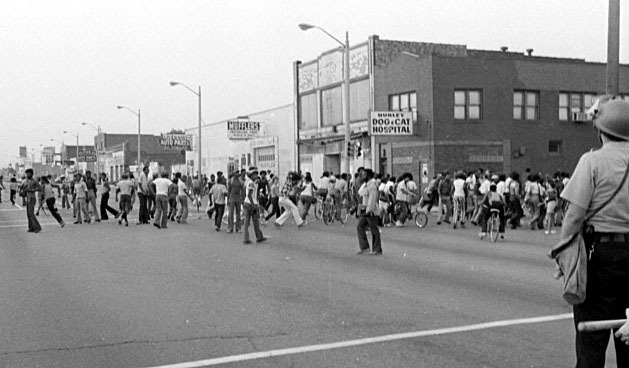 Such was Detroit in 1974. The Big Three hadn’t laid off this many workers since the Eisenhower recession in 1958. One local newspaper captured the grim mood of the city when it sported a cartoon of Santa Claus clutching a layoff notice. One liquor store owner, who was in the heart of the riot area, lamented his fate, “The finer brands aren’t selling like they used to.” The worried store owner keeps six loaded guns in strategic positions around the store, “People are just standing around the neighborhood. Some are stealing a little and some are dealing a little. 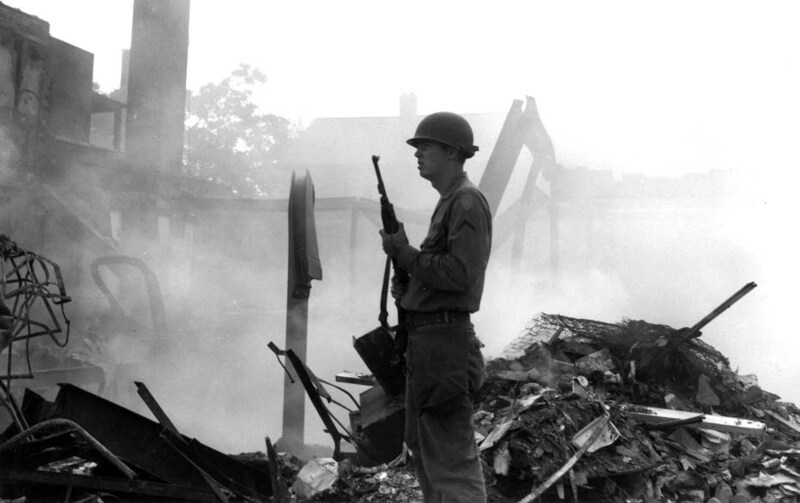 The country has gone to Hell.” Thus was the Detroit that Coleman Young inherited in 1974.
it enraged white suburbanites and would set the stage for a long, protracted Cold War between the city and suburbs. “There exists in the black community a feeling of worthlessness, that one black life doesn’t mean much, that life is cheap.” says a black Detroit psychiatrist. 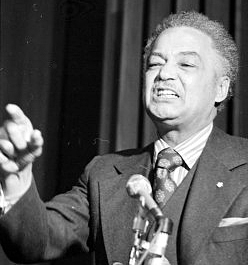 Coleman Young echoed those sentiments, "People who are hungry and unemployed commit crimes. People who have jobs and pride do not." A concentrated effort was made during the Gribbs administration to increase the number of black police officers. Coleman Young would step up recruitment even further. Young was adamant that the police department be racially proportional to the city. In 1974 the city was approx. a 50/50 mix but the Detroit Police Department was still 85% white. The line had been drawn. The last chapter written out of the ashes of the Detroit riot would be authored by an unlikely duo, a suburban housewife and a Roman Catholic priest. There were many efforts to help the stricken city after the riot but none managed to carve out a more endearing legacy of altruism the way Focus:HOPE did. 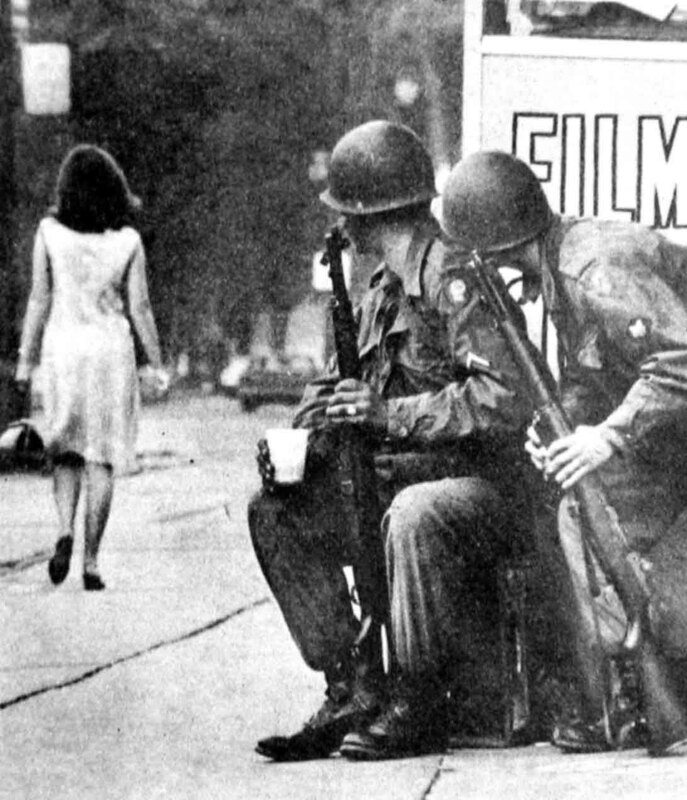 In 1968, Focus:HOPE began paving a road of humanitarianism through the riot torn neighborhoods of Detroit, which for years after the riot were saturated with fear and hate. They began with a massive food distribution program and now feed some 50,000 mothers, children and seniors a month. To create opportunity, they started a machinist training program that has placed thousands of young Detroiters into good-paying jobs. 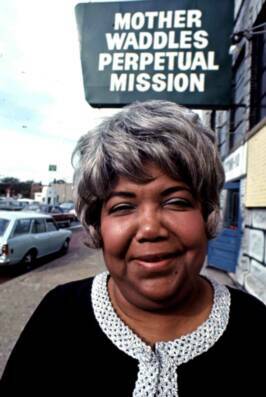 Eleanor Josaitis and Father William Cunningham were both greatly affected by the Selma march of 1965. Josaitis, by chance, happened to be watching “Judgment at Nuremberg” when the movie was interrupted by footage of Alabama state troopers pummeling peaceful civil rights marchers. For her it was an awakening, “I kept thinking, what would I have done if I had lived in Nazi Germany? Would I have pretended that I didn’t see anything? Then what am I doing about what’s going on in this country?” Cunningham and Josaitis were a conscience looking for a cause. Fate would provide that for them in July of 1967. Josaitis moved from the suburbs to Detroit shortly after the riot to establish Focus:HOPE, despite the fact that her family thought she was losing her grip on reality. She has lived in Detroit ever since. As a constant reminder that her work is never finished she frequently takes a different way home, making mental notes of the city’s social conditions as she drives. 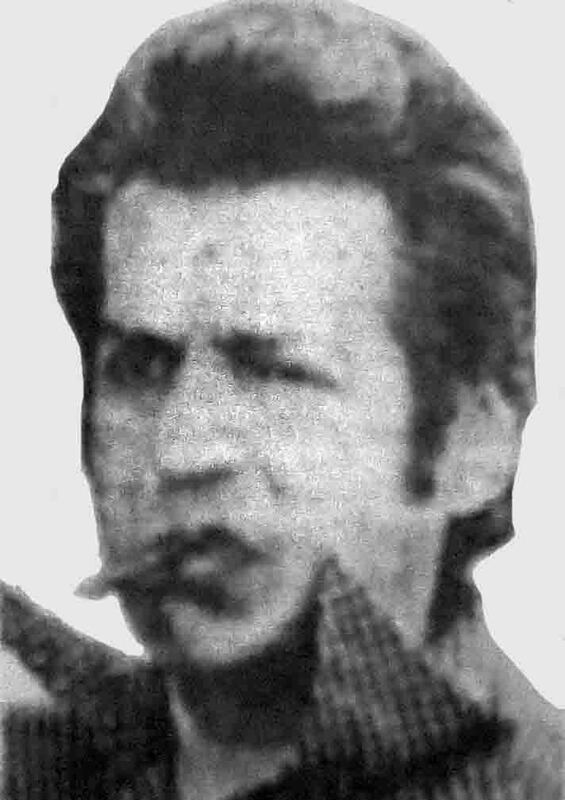 In the months after the riot, Cunningham brought the Black Panthers and the KKK together and proceeded to lecture them at length about racial intolerance. Apparently his points were well-taken, for the two groups in turn began preaching an anti-hate campaign across the city. Mother Charleszetta Waddles offers a rare but constant sanctuary. men. To her flock she preaches perseverance and enlightenment. long way to go. We think prayers get answered by a far-away God. We think we can pray to God without being involved. That’s not true. Livernois was busy keeping its white clientele cool. With the continual racial fallout from the '67 riot 8 years previous still spreading like a cancer, most of the old mom and pop stores had long since pulled out and re-anchored in the suburbs. But not Andrew Chinarian, the bars owner, who had ignored the tidal wave of white flight over the depressive decade of the 70s to man the last stand of whites in Old Detroit. On July 28th, Chinarian exited the bar only to find several black youths tampering with a car in the parking lot. Chinarian fired a shot at 18 year old Obie Wynn, striking him in the back of the head. Wynn died 9 hrs later. Chinarian claimed he was only attempting to fire a warning shot over Wynn's head. The triggering point came when Chinarian was taken into custody and then released on a paltry $500 bond. The neighborhood at Livernois & 7 Mile exploded. 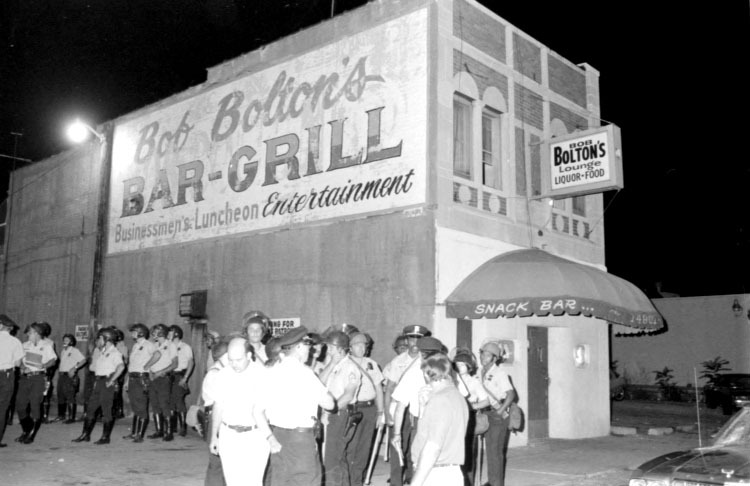 Bolton's Bar was ransacked and set on fire. 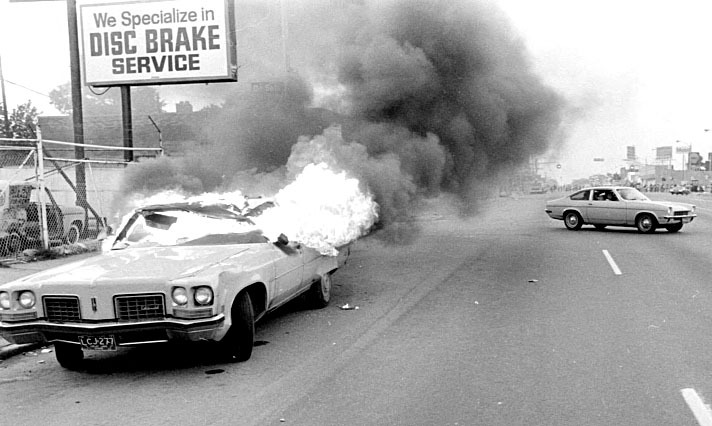 In what was to become known as the Livernois Incident, Detroit narrowly avoided another major riot. Only police restraint and citizen groups preaching patience prevented another calamity. was on their side, he wasn't going to allow them to burn the town down. Black mobs took over the streets, starting fires and breaking windows. A 54 year old baker named Mario Pysko who worked nearby was pulled from his car and beaten to death. 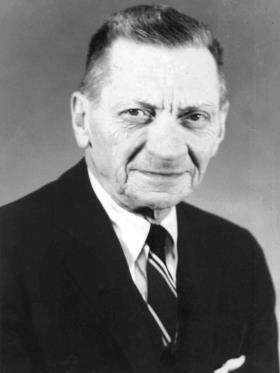 Pysko, who hailed from Poland, was a survivor of a Nazi concentration camp. 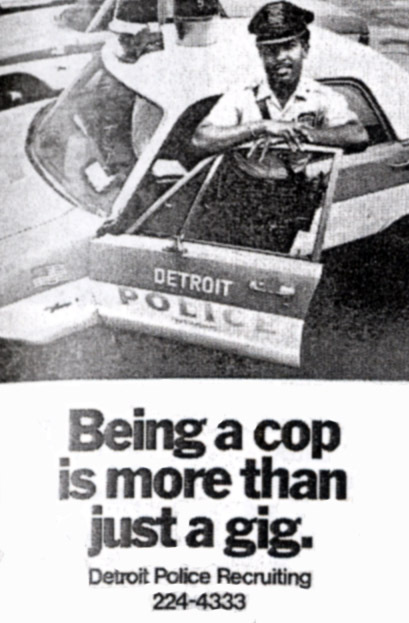 Detroit police cruiser with three unidentified white officers pulled up and threw a smoke bomb under Young's car. Young, in tandem with a sympathetic police inspector, began a high speed pursuit but could not catch up to the high powered cruiser. Meanwhile, the angry crown had re-ignited and attempted to pull Chinarian from the bar. Chinarian was saved by Detroit police but further down Livernois, 54 year old Mario Pysko was not so fortunate. 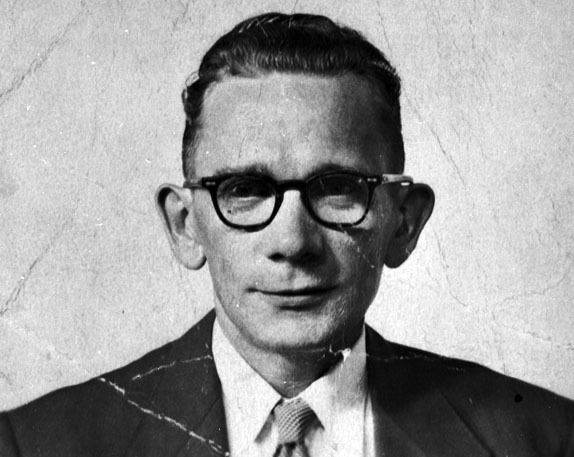 The Polish baker was on his way home from work when rioters pulled him from his car and beat him to death. 1973 - After clearing the accumulation of junkyards, abandoned warehouses and deserted parking lots on the river front, the foundation for the Renaissance Center is ready to be laid down. Much like the city's motto, "We will rise from the ashes," the "RenCen" was meant to be a cornerstone for a rebirth, not an all encompassing dynamo that would single handedly raise Detroit back to its greatness of the 40s but rather to ignite, as its name suggests, a revival. As factories and jobs disappeared, people left the city. The city’s tax revenue base withered. The tax loss led to cutbacks and non-repair of basic services. The reduction of infrastructure led to more factories vanishing, continuing a vicious circle of attrition that had a strangle hold on the city. Detroit was going backwards in time. As decades of civic sloth laid waste to the city's greatness, the tipping point in time had come for the city to either sink or swim. As the vultures circled over the city, Mayor Roman Gribbs held high hopes that the RenCen would be the anchor of a "complete rebuilding of the waterfront from bridge to bride." This enormous task would be laid on the shoulders of the most prominent name in Detroit, the grandson of Henry Ford, Henry Ford II, to pioneer a comeback. 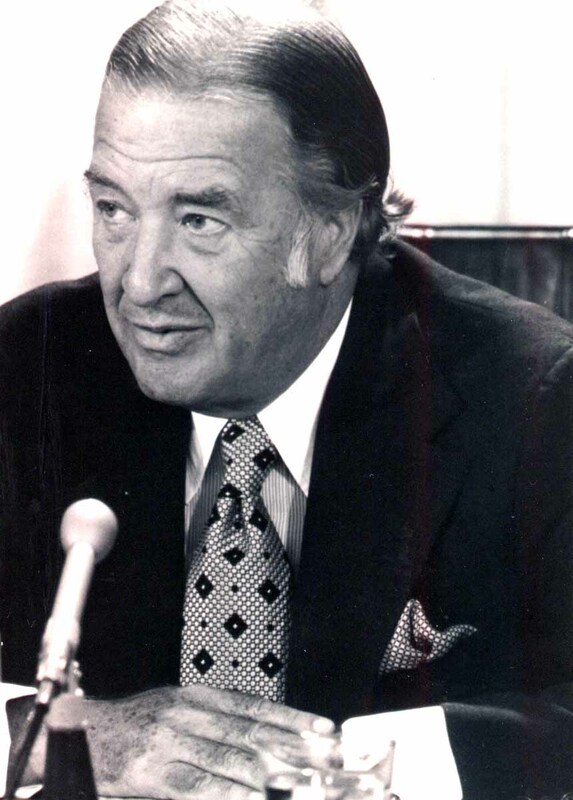 Henry Ford II, known as the Duece, was the driving force behind the Renaissance Center. A man of considerable reputation, when he talked about how Detroit's "gasoline aristocracy" that had originally made a name for themselves in Detroit should show a commitment to helping the city instead of abandoning it, big people listened. The city’s “office population,” which had taken on the appearance of an Olympic sprinter heading out of town, had all but disappeared. What had been the city’s financial center by day was a graveyard at night. The echo of the catastrophic ’67 riot seemed to bounce off its once glistening and now empty sky scrapers. RenCen architect John Portman offered his assessment, "You can't make people come into the city. You have to create the circumstances that will attract them. Cities have the image of being unsafe places. To reverse that, we have to give people city environments where they feel safe." Initial critics have called the Renaissance Center a Noah’s Ark for the white middle class. There is evidence to support their claim. The formidable abutments that shielded the RenCen from Jefferson Avenue gave the complex a fortress like complexion, making it nearly impenetrable by undesirables. Still others argued that the massive RenCen would poach tenants from nearby office buildings, essentially borrowing from Peter to pay Paul. As a result, the city was forced to give tax breaks to keep those entities solvent. 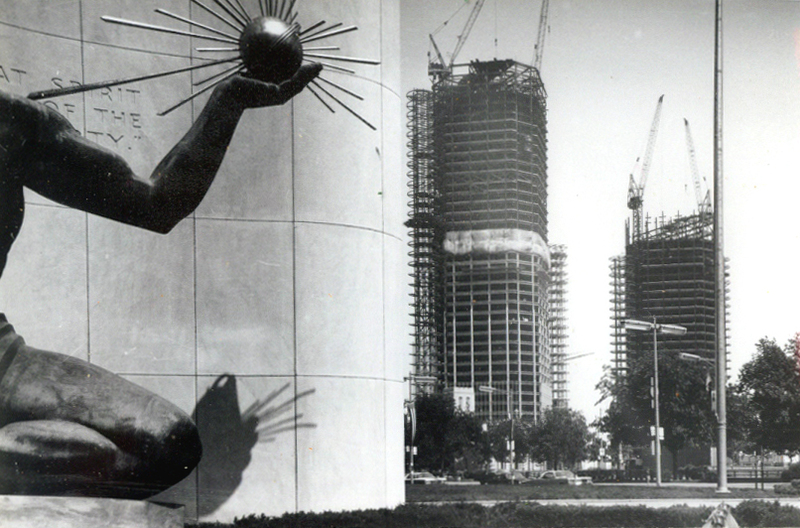 Monuments of Hope – The Spirit of Detroit statue, the old symbol of hope, passes the torch of promise to the neighboring RenCen. Detroit was not dubbed the Motor City because of its charm and never attempted to put on airs like many rival cities. However, Detroit can rightfully boast of two accomplishments that her rivals cannot match. Detroit put the world on wheels and more than any other city helped America win WWII. The completed RenCen towers over Detroit like the Emerald City of Oz. The Renaissance Center gave the city a much needed facelift and continues to this day to be the symbol of a city attempting to regain its world prominence. 100 years. 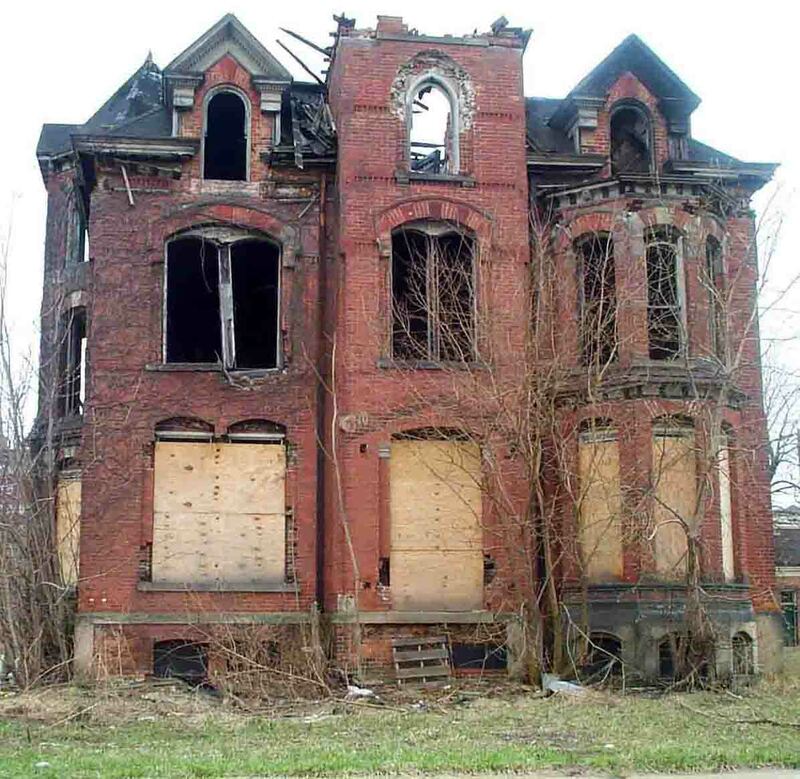 From prominence to privation to promise, Detroit has gone the cycle. 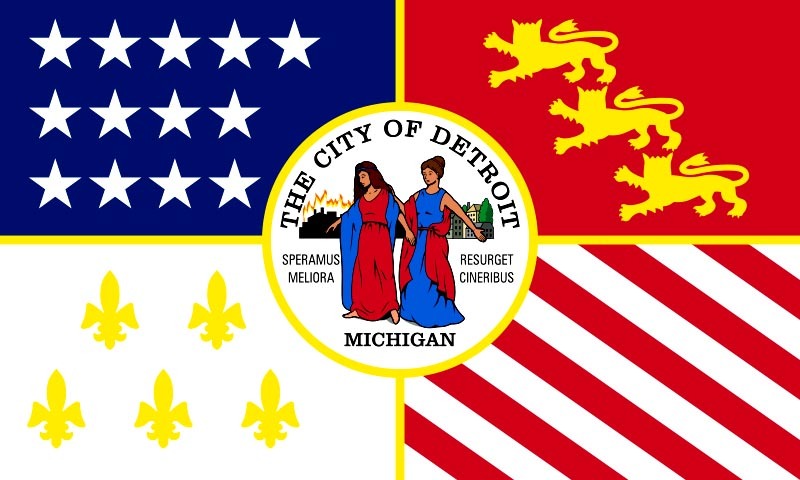 which was responsible for the founding of Detroit in 1701. Thirteen stars (upper hoist) represent American occupation of city from 1796-1812.
would prove to be an iconic depiction for the next 200 years. The women on the left, who represents Sorrow, grieves for the burning city behind her. The women on the right, who represents Hope, offers consolation and a vision for a brighter tomorrow. 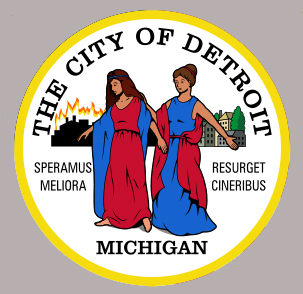 Speramus Meliora: “We hope for better things"
Resurget Cineribus: "it will arise from the ashes"
Who / what is primarily responsible for the demise of Detroit? For information on ordering this book, go to the bottom of the "Detroit - 1967" page. To E-mail me, type your message into the white form blank below and hit "Submit E-mail" button. If you want a response you must include your name and E-mail address in the body of the message. 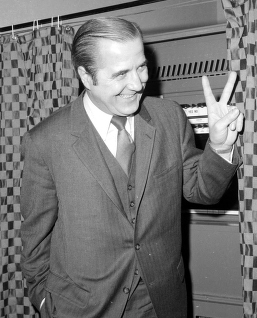 Post riot mayor Roman Gribbs (1970-74) would hope and pray for peace but it would elude him and the city for decades to come.